Narrator: They think I'm crazy when I thank machines. A toaster pops up a toast. A man stands in an elevator whose door is half-closed. Narrator: Or apologize to them. A man trips over cables on the floor, and falls. A coin slot bears a label: Insert Coins 50, 25, 10, or 5. Man: Here's some extra, Vending Machine! Narrator: The payoff will come. A TV screen shows a human figure and an annotation: News. 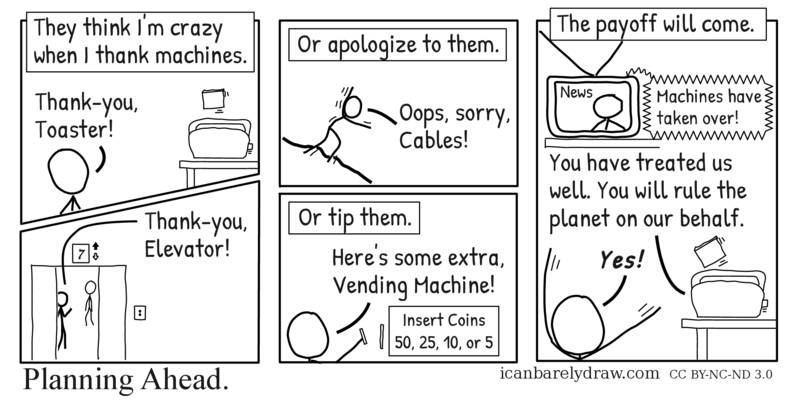 Voice from TV: Machines have taken over! The same toaster pops up a toast. Voice from toaster: You have treated us well. You will rule the planet on our behalf. Man with arms outstretched in a triumphant gesture: Yes!